Located in Bradford and comissioned by a Self Storage Company, this new, purpose built jackleg cabin provides a reception area c/w counter, a fully DDA compliant disabled toilet and a private office. This prefabricated building is located in a car park directly outside the Industrial Unit and provides a total floor area of 45 sq. m (measuring circa 12.00x3.76m). This jackleg office is fully Building Regulation compliant. Internally, the walls and ceilings are finished in easy to maintain vinyl faced plasterboard whilst the floors are covered with high quality carpet tiles. The jackleg cabin is fitted with electric LST heaters to maintain the facility at a constant temperature. Externally, the walls and fascia of this jackleg building are finished in low maintenance plastisol steel - the colour being of the clients choice. The windows and doors are fitted with electrically operated security shutters providing much needed additional security. The roof is constructed with a mono-pitch flat roofing system and covered with a hard wearing 'Hypalon' blanket c/w square section uPVC rainwater goods. This prefabricated jackleg unit is an ideal solution providing additional administrative office space where floor space within the Industrial Unit is at a premium. 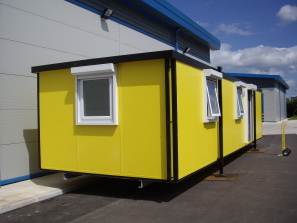 This jackleg cabin was manufactured "off site" and was delivered, installed and commissioned within one day, thereby keeping disruption to the client and public to a minimum.